Could I Get LEEDS With My Taco? Yum! Brands Inc. is an international powerhouse in global food service. With brands such as KFC, Taco Bell, Pizza Hut & Dong Fang Ji Bai (for those of you in China) this huge conglomerate holds significant sway in the restaurant industry. So, it is exciting to see this company embrace LEEDS standards in building. Yum! 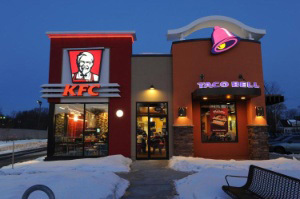 Brands opened up its first LEED building in the United States with a joint KFC and Taco Bell in Northampton, Massachusetts. This building, opened this past December, represents a step in environmentally friendly building. The Leadership in Energy and Environmental Design (LEED) Green Building Rating System, developed by the U.S. Green Building Council (USGBC), provides a suite of standards for environmentally sustainable construction. The restaurant is built to use 30 percent less energy and water than a conventional building, cut CO2 emissions, reduce waste and educate visitors and employees on sustainable design. It does this through a number of technologies. For example, it uses rainwater harvesting for irrigation and low-flow fixtures to reduce water consumption. Solar energy is used to pre-heat all air coming into restaurant to reduce natural gas usage, while LED and EnergyStar appliances reduce energy usage. But the technology is not the only difference. Most of the building materials come from recycled content or were sustainably harvest. This creates a green building from the inside out. KeenforGreen applauds Yum! for taking this first step and hopes for wide-spread adoption of LEED standards for all future restaurants.